A communication node used during the Battle of Installation 00. Spikes of Obesience, also known as Covenant comm relays or comm nodes, are mobile communication devices used by the Covenant on the battlefield. The first link in the Covenant's control began with the placement of these Spikes in areas they intended to dominate. The Spikes of Obesience were used by the hegemony as a means to connect to their battle network and functioned as a combination of proselytism, network up-links, communication hubs, and sensor relay nodes. 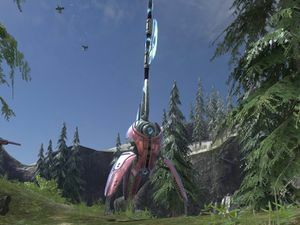 The comm nodes come in several different variants, with the most common variant depicted as tall devices, consisting of a stalk protruding from a central structure, supported by a trio of "legs". They are primarily magenta, black, and silver in color. Some comm nodes keep the tall antenna, but with a single large base structure, while others bear more resemblance to the Covenant supply case, with antenna and a keyboard attached. Comm relays were used extensively during the Covenant's vicious assault on the planet Reach, and the follow-up Battle of Installation 04 as well as during the Battle of Earth the Battle of Installation 05, and the Battle of Installation 00. The comm will remain active if one of its legs has been broken off, and it can still be picked up in Forge. To fully destroy it, one must break the tower off the base. On the main body of the node, something resembling the Marathon symbol can clearly be seen. A closeup of the Halo: Combat Evolved comm node, bearing more resemblance to the Covenant supply case. The Halo: Combat Evolved comm node. Concept art of a Covenant communication antenna in Halo: Reach. A communications antenna on Reach. A front view of the Halo 2: Anniversary communication node. A side view of the Halo 2: Anniversary communication node. ↑ 1.0 1.1 1.2 Spartan Games: Make your Halo table look awesome!